At 232 pages, Stephen Kuncewicz's debut publication is certainly comprehensive. 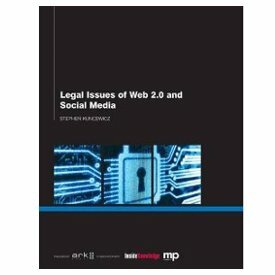 The book, Legal Issues Of Web 2.0 and Social Media, is the first literature, to my knowledge, which explores the legal implications for companies operating across social media and the web. Its scope is impressive - covering topics like intellectual property law, copyright, defamation, and privacy - and the publication offers an insight into existing legal precedents for those operating in social networks. As a legal text, it offers a no-nonsense set of guidelines for those working across social channels, with entire chapters dedicated towards defamation, branding and confidentiality. The publication, which is founded on Stephen's knowledge as a solicitor, uses real-world examples (the Trafigura scandal and the Jan Moir outcry for instance) to demonstrate the potential legal issues of social media use. It takes a diligent examination of the pitfalls of a Twitter or Facebook profile, outlining the existing laws and providing a framework for those organisations wishing to step into social media. The publication does an excellent job of framing social brand management from a legal perspective. It draws in examples from a range of social networks to highlight how organisations can manage their reputation online without falling foul of existing laws and legal precedents. Indeed, it also highlights a number of companies which have faced ramifications due to their heavy-handed social strategy. "While these may be some of the least commonly thought-of problems facing web users, some high-profile cases have shown that the courts will not tolerate online behaviour which breaks offline laws." Indeed, this final section is possibly the most important for those working in social media, particularly when you consider the potential implications of breaking the law for your company or your client. Thankfully, Kuncewicz explores the current legal framework without resorting to jargon or legalese; this is clear-cut advice for those who want to avoid falling foul of the judiciary via social media.